Keyless cars might have been billed as the next big thing in keeping cars safe, but the statistics speak otherwise, with gangs reportedly using cheap devices bought on the internet to hack into cars' security systems. It's not all hi-tech though, with some keyless cars also reported to have been stolen the old fashioned way - simply by towing the vehicle away. It isn't just the posh cars that are at risk; many modern motors in all price brackets now use a push-button to start the engine, rather than the traditional key. 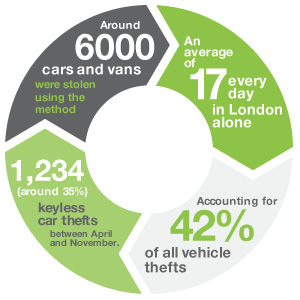 In the past year around 6,000 cars and vans were stolen using the method - an average of 17 every day - in London alone. The number accounts for around 42% of all vehicle thefts, meaning that a much higher proportion of keyless cars were stolen on average. Outside of the capital, the West Midlands also saw a worrying number of keyless car thefts, with 1,234 (around 35%) keyless car thefts between the months of April and November. Why the spike in thefts? At blame for the spike is a change that was made to European legislation, which made it much easier than it had been for gangs to access the on board computer systems in cars of all kinds. In the past, you had to go back to your dealership to have a replacement key made if you lost it, but this was ruled to be uncompetitive as people ought to be able to go anywhere, not just their manufacturer. This means that the device that criminals use to steal cars now has a legitimate use, in the hands of trusted mechanics who can replace lost or damaged keys. 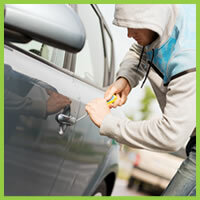 However, in the wrong hands, it can allow thieves access to your car. The rise in keyless car thefts may be fuelled by a lucrative black market in spare parts - if stolen, your pride and joy could be taken to pieces and sold off in bits! The best way to stop this from happening is to fit a car tracker into your vehicle, allowing you to see where it is at all times. If your car is stolen, you can pass this information on to the police to assist them in apprehending the criminals and retrieving your car or van. By sending location data back to a control centre, a car tracker can allow owners to trace a vehicle as soon as it has gone - motion trackers mean that as soon as the car is on the move, the car tracker is active and Tracker Fit can send information to the authorities, helping to prevent theft and retrieve cars. To date, Tracker Fit has recovered vehicles worth a staggering £460 million and it's all down to the vehicle trackers that we offer. We've got a wide range of options that are approved by insurers, and we offer free installation at your home or workplace, nationwide. Give us a call on 0800 096 3092 for free advice and to purchase your car tracker, for complete peace of mind.